Certified copy of your marriage license(s) if your last name does not match the last name on your birth certificate. The N.C. REAL ID will make it more convenient when you need to board a commercial airplane or visit a military base or other federal facilities. Effective October 1, 2020, federal agencies will enforce tougher security standards at airport check-ins, federal buildings, military installations and nuclear sites. 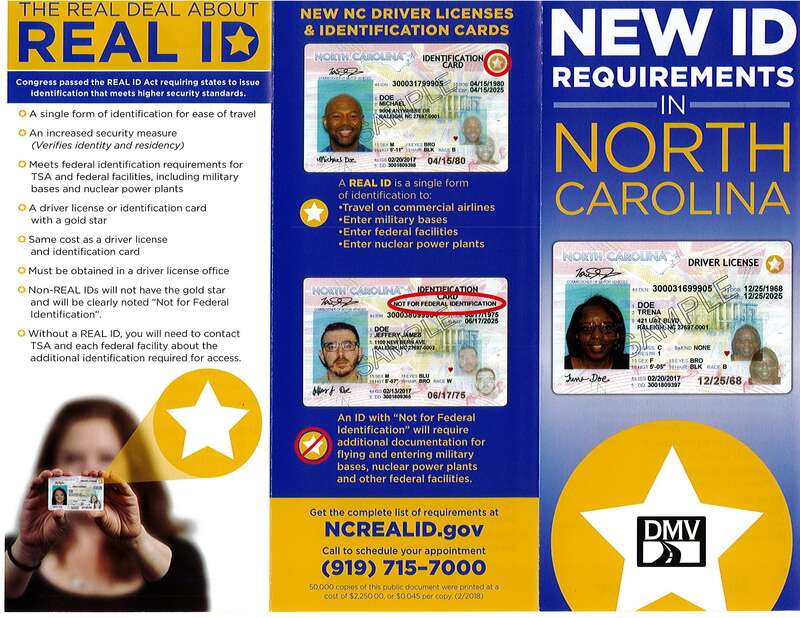 The N.C. REAL ID is just like your traditional license or ID but has a gold star at the top. Driver licenses and IDs without a gold star are noted: “Not for Federal Identification.” The cost is the same whether you choose to get the Real ID or not. 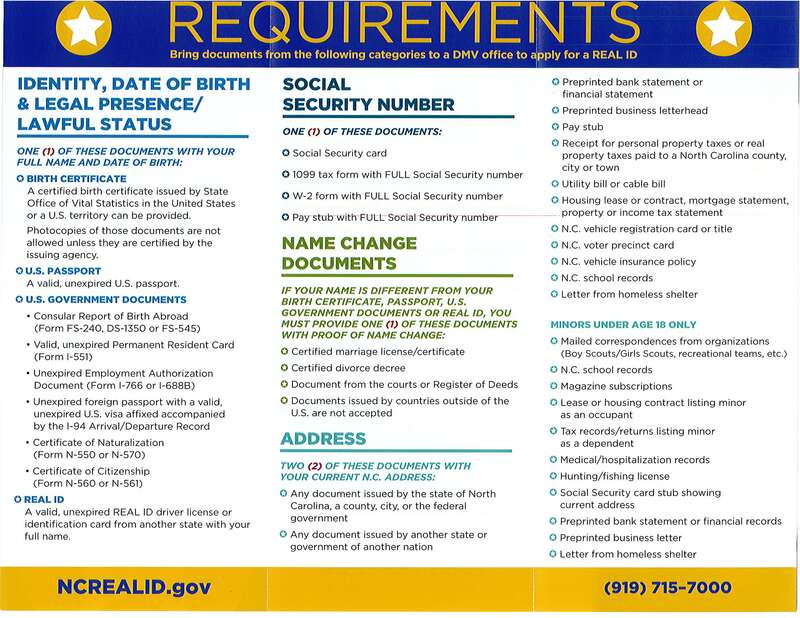 To get the REAL ID you simply need to take the *required documents to the DMV office at the time you renew your license. As an alternative, if your license is not due to renew before the 10/01/2020 deadline, you may choose to get a duplicate license now for REAL ID purposes. (The cost of a duplicate license is $13.00) It will not change the expiration date but it will get you the REAL ID license. Please note, once you submit the required documents to the DMV, you will not have to go through this process again. Without an N.C. REAL ID, you will still be able to board flights and enter federal facilities, but you will have to provide additional documentation with your traditional license or ID. You must also contact the Transportation Security Administration and other federal facilities about their required identification before each visit. To avoid inconveniences, make sure you have all necessary documents before visiting the driver license office. To confirm identity and residency under the federal law, NCDMV scans these documents and permanently and securely stores them in your DMV record. You can expect to receive your N.C. REAL ID driver license or ID card by mail in 10-15 business days. *Required documents are shown on the attached REAL ID brochure. If you have any questions, please free to call our office, Yancey County Register of Deeds 828-682-2174. You may also visit the DMV website at www.ncdot.gov/dmv/driver/realid/ or you may view the brochure that we have attached for your convenience.